The 2016 Hyundai Veloster hit the Chicago Auto Show last week sporting some stylish changes to its funky, asymmetrical three-door hatchback design. 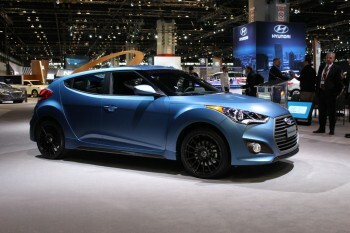 The 2016 Hyundai Veloster and Veloster Turbo also feature revised styling and a new limited-production Turbo Rally Edition model based on the Turbo R-Spec model. New hood design without the current model’s faux hood vents, and revised front grille with a dark gray front grille surround. Redesigned 17-inch alloy wheels, and the Veloster Turbo gets an exclusive 18-inch wheel with a machined finish and argent spoke bevels. 10mm-wider tire (now 225/40R18) are fitted to all 18-inch wheels, including the available 18-inch wheel on the base model. Black bolster seats with (yellow inserts and certain exterior colors). For those of you with a need for speed and love of all things “drift” the Hyundai Veloster Turbo and Turbo Rally are here for YOU. Check out this illuminating video of the 2016 Veloster Turbo. We expect these thrilling new speed demons on the lot soon! Stay tuned to our blogs and we’ll keep you posted on when these drift-machines arrive!